• Wohlfhart Haus Dinner Theatre "Back to the 50s"
​Come down with the 'Rockin' Pneumonia and the "Boogie Woogie Flu" as you see a "Sweet Talking Guy" "Shake Rattle and Roll" through the 1950s with the "Chain Gang" as they will be "Rocking Around the Clock" figuring out "Who Put the Bomp" in this fantastic tribute to a lost era. "Let the Good TImes Roll" as you “Shout” some of your favorite songs with us including " Earth Angel", "The Twist", "Blue Moon" and so much more. Click here to sign up for this tour. What could be better than a 1-day mystery tour? The answer is: A 2-day Mystery Tour. We will experience more adventure and surprises. This 2-day tour will take you to places never been offered before by Majestic Tours. Gosh, places I have not ever visited but always wanted to. So come along for a wonderful time of visiting new places. Day 1: Memphis: Welcome aboard, as we begin today’s journey through the rolling hills of Tennessee. We stop in Jackson, Tennessee for a Southern buffet dinner, included. We then continue to Memphis for a two-night stay at the 4 star Memphis Guest House at Elvis’ Graceland. Day 2: Elvis Presley’s Graceland / Memphis city tour: This morning we will visit Elvis Presley’s Graceland. Elvis Presley’s beloved home allows visitors to step back in time to see the exuberant lifestyle of “The King of Rock’n Roll.” A unique new part of the tour is the Elvis Experience Tour, which includes the Entertainer Career Showcase Museum & Elvis Discovery Exhibits. Also included is the Elvis Presley Auto Museum. Walk down a landscaped highway, surrounded by 22 vehicles that were owned by Elvis. This afternoon we’re joined by a knowledgeable local guide for an exciting city tour of Memphis. After our tour we head to Beale Street for our evening meal and free time. Day 3: Sun Studio / Nashville’s Grand Ole Opry: This morning we tour Sun Studio, the birthplace of rock n' roll and home to the "Million Dollar Quartet" before heading to Nashville for our overnight stay. Tickets are reserved for tonight's show of the Grand Ole Opry. Day 4: What an amazing trip! It took us back to the music I understand. 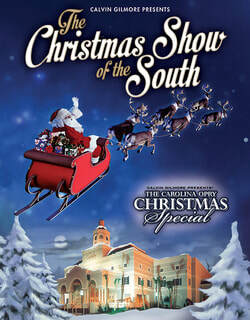 This afternoon we will take our VIP seats for the best Christmas show in the Southeast, the Carolina Opry Christmas Special at Myrtle Beach. The Carolina Opry blends beloved classics with great new favorites, all bound together by fresh comedy and breathtaking dance. It's warm, it's funny, it's shamelessly sentimental, and you are going to love it more than ever! The Carolina Opry Christmas Special is a true celebration of America's most-loved holiday. Japan is one of the oldest of all countries. Nowhere on the planet does the modern and the ancient coexist more harmoniously than in Japan. Nov. 17: We depart the airport en-route to Japan, one of the most fascinating countries in the world. Getting beneath the surface can be a challenge so we are lucky to have a guide to help you embark on unique, memorable experiences. Friday, Nov 29: Tokyo (Yokohama), Japan Arrive 6:00 AM We say goodbye to a beautiful, enchanting land and return to Charlotte Douglas Airport. If you want more detailed information of the Japan ports, tours and excursions let me know and I will forward the information to you. Included: Three nights in Tokyo, transportation from airport to our hotel. Two full days of touring with a professional guide, transportation from the hotel to the cruise port, 1 evening meal, 2 lunches, 3 breakfast on the land package, eight nights aboard the Diamond Princess with meals and entertainment included on our cruise and transfers from the cruise ship to the airport for our flight home. I have contacted guides, in each port. I have made arrangements for private shore excursions for only our group, except for Osaka, Japan and South Korea. I am working on excursions for South Korea but the cruise lines offers so many different tour options at Osaka, I feel it best for you to decide on what you prefer to visit. Cost for Tokyo pre-cruise and shore excursions: Transfers to hotel and cruise ship, 2 full days of private group tours, 3 nights lodging, taxes, breakfast, lunch and shore excursions (explained in “Included” topic above). Cost per person rooming double: $1394, Single supplement: add $200. Cost for cruise rooming single: inside stateroom $3092. Airfare cost: $1879 From Charlotte. Pre-cruise visit to Tokyo is optional. If you wish to do the pre-cruise stay and the cruise package add the cost together. As mentioned the air cost is an estimate. I have not confirmed any air schedule. Should you like detailed information of the Japan ports, tours and excursions let me know and I will forward the information to you. I must admit I have researched and dug deep to find the best attractions and guides for this tour. I have included impressive shore excursions and the pre-cruise land package with private tours so you will not experience so much add-on cost while we are enjoying our Japanese vacation. ​ Note: I am asking for you to help me out by making deposits and final payment in a timely manner so that I can make payments into my suppliers. I don’t want to miss out and neither do you. Cancellation policy: A full refund will be given to those booked on motorcoach tours when cancellations are received 31 days before departure. Cancellations received less than 31 days before will receive all monies paid except for non-refundable expenses charged to us by hotels, meals that are included and pre-purchased tickets. Of course cruises and air fare have a different policy which will be informed of. So, do you think you want to go? Book early! We understand that it is often difficult to plan your vacation far in advance; however, we encourage you to make early reservations on all tours in order to guarantee that your tour is confirmed. We must let hotels, theaters and other attractions know how many passengers are on our tours. Sometimes we must pay the admissions as early as six months in advance! If we have not received enough bookings on a tour we are forced to cancel it or lose our deposits and payments. Such a situation is very disappointing to us, but also to those of you who may call for reservations one or two weeks before a trip is scheduled. The earlier our customers make their reservations, the less likely a tour will be to canceled. Contact us to sign up for tours now! REFUNDS: A full refund will be given to those booked on motorcoach tours when cancellations are received 18 days before departure. Exceptions will be noted on your deposit receipt or in the tour letter. Cancellations received less than 18 days before will receive all monies paid except for nonrefundable expenses charged to us by hotels and pre-purchased tickets. All efforts will be made to ensure a full refund. Air and cruise lines set their own cancellation fees. You will be charged according to their policies. INSURANCE: All passengers are insured only while on the motorcoach. Individual trip insurance is available. Call for details.